Our job every day is to make your job a little easier. It might mean providing a quick lead time for your super-tight deadline or creating just the right application design in our in-house testing lab. In many cases, it’s finding ways to make our pallet flow systems help you be even more productive. Mallard’s simple, cost-effective pallet flow entry guides are a good example. Added to the charge side (or entry-side) of the system, pallet flow lane guides make your forklift operator’s job a whole lot easier. Each pallet put-away is quicker and easier with better lane visibility and pallet alignment, increasing productivity and reducing risk for product and equipment damage. 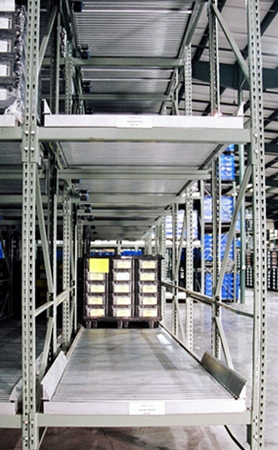 Guides can be either top-mounted on the pallet flow lane itself or rack mounted depending on the application. Shown below are two examples showing guides using full roller, split roller and Magnum Wheel pallet flow lanes.